Vietnam’s benchmark VN-Index rallied for the tenth consecutive trading session on September 8 as investors continued increasing buying on improving sentiment. The shares of 295 companies and five closed-end funds listed on the Ho Chi Minh City Stock Exchange rocketed 2.09 percent, or 9.27 points, to close at 453.26 points. Across the benchmark, there were 207 gainers, 45 losers, while 48 remained unchanged. 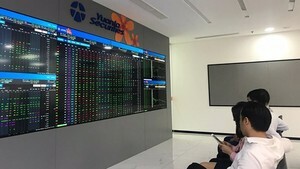 Trading volume on the city bourse improved by 35 percent over the previous day as around 60.52 million shares changed hands at a value of VND944 billion. Sacom Development & Investment Corporation (SAM) topped the list of most active shares in volume with 3.2 million shares changing hands. Saigon Securities Inc. (SSI), the country’s largest brokerage, followed with 2.34 million shares traded. Tan Tao Investment & Technology Joint Stock Company (ITA) tagged along with 2.2 million shares. Viky Plastic Joint Stock Company (VKP) built up 5.88 percent to VND1,800. Other winners on the city bourse included Basa Joint Stock Company (BAS), Cuu Long Petro Urban Development & Investment Corporation (CCL), and VitranschartI Joint Stock Company (VST). Vinaship Joint Stock Company (VNA) collapsed 11.25 percent to close at VND7,100. Ca Mau Frozen Seafood Processing Import Export Corporation (CMX) capped its three-day winning streak, losing 5 percent to VND7,600. Cuong Thuan IDICO Development Investment Corporation (CTI) crashed 4.93 percent to VND19,300. The Hanoi’s HNX-Index of the smaller bourse in the north restored the second day, reviving 0.25 percent, or 0.19 points, to finish at 76.94 points. Trading on the northern floor reached more than 70 million shares worth VND822.83 billion. Meanwhile, the UPCoM-Index of unlisted shares also widened 0.35 percent, or 0.11 points, to 31.50 points. A total of 423,712 shares changed hands at a value of VND3.06 billion at 2:43 pm local time.